El Paso Federal Courthouse - Volz & Associates Inc.
• Probing of selected pieces to analyze the anchorage system and its condition. 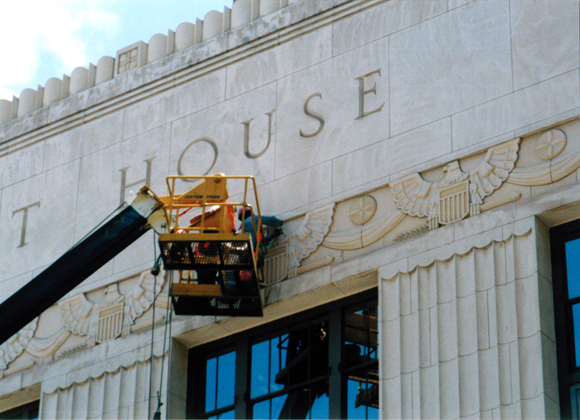 In 2001 an 18-inch terra cotta seal fell from the El Paso Federal Courthouse frieze, shattering into four pieces. The U.S. General Services Administration concluded that a prompt and comprehensive investigation of the frieze was needed to assess conditions and determine if this was an isolated incident, or if there were other issues that posed a threat to public safety. Volz & Associates, Inc. performed a detailed investigation of the 628 terra cotta pieces comprising the frieze. The scope of work included coordinating conservation of pieces with minor damage, repair of pieces with cracks and small loss, and replacement of large pieces with significant loss. In 2003, this project received GSA’s Public Buildings Service Heritage Award in the Conservation/Restoration category.